Heaton High Pit (also known as the Far Pit or E Pit) was part of Heaton Main Colliery and was in High Heaton, opposite where Heaton Manor School is now. The mine lay just to the east of the Thistle Fault where the valuable, thick seam of coal known as the ‘Main Seam’ lay much further underground than in neighbouring areas to the west. Consequently, it was only towards the end of the 18th century that engineers had developed the technology to mine there. Heaton Main Colliery was technically one of the most advanced collieries in the world, attracting visitors from elsewhere in Britain and further afield, even America. Huge steam pumping engines drained the mine and a steam locomotive hauled coal along the colliery railway to the River Tyne. This was before George Stephenson built his locomotives for Killingworth Colliery. We now remember Heaton Main Colliery for the 1815 disaster, in which 75 men and boys died. This took place about a mile from Heaton High Pit, approximately below the site of Saint Teresa’s Church. But there were problems at Heaton High pit too; a fire in 1810; and in 1813 ‘creep’, which caused the colliery floors to lift, meaning the pit was abandoned until 1816, one of the things that proves that this was not the site of the 1815 disaster. What is particularly interesting about High Pit is that, unlike Heaton’s other pits, a small mining community, what we might call a ‘hamlet’, grew up around it. We’ve been researching the ten-yearly census records and newspaper reports relating to this community. Thank you to Newcastle City Library for permission to use this photograph. The above photograph of cottages at Heaton High Pit was taken in 1922 just before the present High Heaton estate was developed around the wooded area immediately above the old pit head, which we now know as The Spinney. It gives an idea of what the hamlet might have looked like. In 1841, there were around 25 households. Almost all the men were coal miners and, although 70 year old William Fenwick was a horse-keeper and 15 year old John Hall an apprentice smith, they too would have worked at the pit. Theirs were important jobs in the mining industry. The surrounding area was rural: 35 year old John Twizell and 30 year old Alexander Cairns earned their living as agricultural labourers. Only two young women are listed as having a job: 15 year old, Margery Anderson and Elizabeth were servants. In 1851, a few of the families remained from ten years earlier but many were recent migrants from other mining communities around Newcastle and the immediate area. Most men were still colliers but 18 year old Septimus Widderington was an engineer, 26 year old William Gascoigne a gardener and 40 year old William Taylor an agricultural labourer. Several women and girls are recorded as working: Elizabeth Clarke (18) as a dressmaker and Ann Ayre (14), Sarah Bell (21) and Jane Stephenson (38) as household servants. Whereas boys as young as seven were among those killed in the 1815 disaster, the Mines Act of 1842 had made it illegal to employ anyone under ten underground, so the youngest miner in 1851 was ten year old James Cross. Nevertheless, siblings Anne, Mary and Christopher Roaby, aged four, five and seven, were the only children, among the many who lived in the hamlet, recorded as going to school . Heaton High Pit was closed in 1852, the battle with floodwater having finally been lost, but many men of the village continued to work at nearby Benton Colliery. This was situated on what is now Wych Elm Crescent by the tram track across Benton Road from the Newton Park pub. You can see how close they were and how rural the area was on the OS map below. In 1861, the village was still a mining community but some of the residents had come from further afield: for example, John Bowes, a cordwainer, had been born in Yorkshire; and Elizabeth Nichol in Cumberland. The recent birth and expansion of railways was a possible factor. A school is listed in the census and 12 boys and girls, aged between 4 and 12 are recorded as attending. The youngest collier was 15 year old John Burdis. Ann Bell, a 50 year old married woman, recorded as the head of household, was a shopkeeper and her daughter, 24 year old Hannah Ramsay, earned her living as a dressmaker. By this time though, there were also a number of uninhabited dwellings, a sign perhaps that that the housing was now considered substandard and, with the local pit closed, the village had become a less attractive place to live. In January 1862 miners, George Handy and Robert Minto, both of Heaton High Pit village, were killed in an accident at Benton Colliery. In April 1864, the auction of the materials of 21 cottages at Heaton High Pit was announced in the local press, although the 1894 Ordnance Survey map below shows a couple of cottages just to the north of the present Spinney. By this time, trees had been planted as was customary over disused pitheads. You can also see that, although Jesmond to the west was beginning to be developed, as was Heaton to the south, High Heaton was still very rural, the sight of Byker and Heaton Cemetery being the most obvious change from 36 years earlier. And just before WW1, when the map below was published, not that much seemed to have altered. But after the war, things moved quickly and by the late 1920s, many of the houses we are now familiar with had been built and the Heaton Secondary Schools had opened. But more of them another time! This article was researched and written by Chris Jackson with Les Turnbull and Michael Proctor as part of Heaton History Group’s HLF-funded ‘Heaton Beneath Our Streets’ project. This entry was posted in Group Activites, Research and tagged Coal mines, Heaton High Pit, High Heaton, High Pit, miners, mining, schools, Spinney on October 10, 2016 by oldheaton. 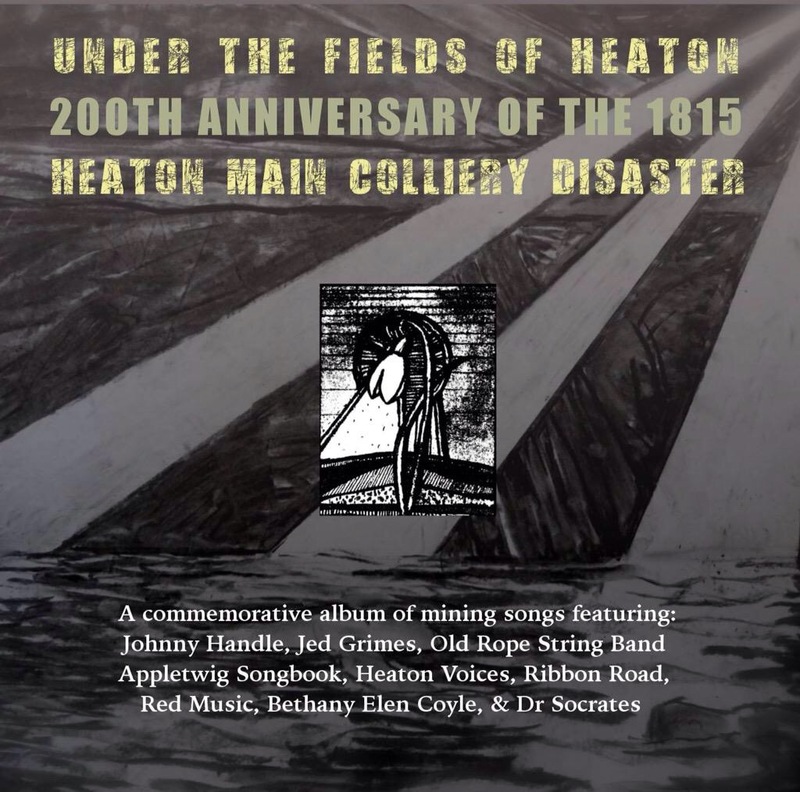 On 25 May, it will be our great pleasure to present the world premiere of Under Heaton Fields, a film made as part of the commemorations of the Heaton mining disaster of 1815. It will be shown along with two other films about the accident and its 2015/6 commemorations and another recent local history film, The Great Tyneside Fire 1854. Under Heaton Fields documents some of the activities that have taken place in Heaton during the bicentennial commemoration of the Heaton pit disaster of 1815. This includes work done in schools, concerts, the memorial service and the choral work ‘The Heaton Suite’ especially written for the occasion and performed by local choirs and musicians. And through this prism the film will also look back to 1815 and, through the experiences of the characters of John Buddle and the Thew family, dramatise the events that morning in May and nine months later on the discovery of the bodies. The film has been made with the help of undergraduates, members of staff, and graduates of the Film/TV course at Northumbria University. Director, Peter Dillon, a member of Heaton History Group, will introduce the film and answer questions. 200 years is an audio visual work made by year 6 children at St Teresa’s School as part of the Under the Fields of Heaton programme. The class worked with visual artist and Heaton History Group member Tessa Green and sound artist and writer Ellen Phethean in summer 2015. Looking at life in 1815, 1915 and 2015, the children made a soundscape based on the colliery disaster as well as collages, drawings, creative writing, singing and interviews all of which were edited together to make the final piece which even speculates on what life might be like in 2115! Tessa and Ellen will introduce the film and answer questions. Shafts of Light Kyle Donnelly and Sarah Hibbert, graduates of the Film/TV Production course who worked with Peter Dillon on Under Heaton Fields have shot and edited a short film about lantern making under the tutelage of Louise Bradley at the Woodlands Community Centre and their subsequent use during the commemorations at the Spinney and King John’s Palace in February. Tessa Green also shot footage at St Teresa’s School with Year Six pupils. All three films will stand as a record of what happened in 2015, while recollecting 1815. The Great Tyneside Fire, 1854 commemorates a mighty explosion almost half a century later. Fire tore through communities, homes and workplaces on both sides of the river. Newcastle and Gateshead quaysides were almost totally destroyed, 53 people died and many hundreds were injured. The film was made by Mark Thorburn of Lonely Tower Film and Media with the help of historians, Anthea Lang, Freda Thompson and Graeme Turnbull. Anthea Lang will introduce the film and answer questions. The event will take place at The Corner House, Heaton Road, NE6 5RP on Wednesday 25 May 2016 at 7.30pm and is FREE to Heaton History Group members. Non-members pay £2. The doors open at 7.00pm. You are advised to take your seat by 7.15pm. Please book your place by contacting maria@heatonhistorygroup.org / 07443 594154. Booking is open to Heaton History Group members only until Wednesday 9 March. This entry was posted in Events, Resources and tagged Coal mines, Heaton Main Colliery, miners, mining on February 20, 2016 by oldheaton. A film is in production to commemorate the 200th anniversary of the Heaton Mining Disaster of 3 May 1815. The film will feature some of the commemorations, such as the concert in St Teresa’s Church Hall on 2 May and the ecumenical service the following day – the anniversary itself. Within that contemporary framework or structure using dramatic re-enactments we also hope to give an impression of what happened in 1815. There is a call from Heaton History Group member, Peter Dillon, for volunteers to take part in several scenes to be filmed in Heaton Park on Sunday 19 July from 9.00am – (approx) 10.30am. In the first instance males aged from 12 to 82 are needed to represent the 75 miners who died. These representatives will be filmed emerging from the trees in the park. Several 7 year olds from St Teresa’s Primary School will represent the boys who died. ‘Miners’ please meet at the children’s playground by 9.00am. And secondly – from approximately 9.30am – men, women and children of all ages are welcome to represent contemporary Heaton and will be filmed walking together in the footsteps of the miners – indeed across the ground below which they died – down the grassy incline towards the adventure playground. The walk is intended both as a mark of respect for those from this place that came before and a celebration of the vital and vibrant community Heaton is today. The meeting place is again the children’s playground in Heaton Park. Please come dressed in your everyday clothes (or whatever is comfortable). The aim is for the shoot to be complete by about 10.30am. The plan is to complete the film by the 201st anniversary in 2016 and then show it in church halls and community centres. This entry was posted in Group Activites and tagged Coal mines, Heaton Main Colliery, Heaton Park, mining, St Teresa's Church, St Teresa's School on June 25, 2015 by oldheaton. This year is the 200th anniversary of Newcastle’s worst ever peacetime catastrophe, often known locally as ‘The Spinney disaster’. In the first of a series of events to take place in and around Heaton over the coming year, Les Turnbull will give the fascinating historical background, tell us what happened at Heaton Main Colliery on 3rd May 1815 and in the months that followed – and he might surprise you when he explains WHERE the events unfolded. Les, who is a member of Heaton History Group and an acknowledged expert on the history of mining, especially in the North East, was born near the Middle Pit in 1941, educated at Tosson Terrace Primary, Chillingham Road Secondary and Heaton Grammar and now lives near the ‘C’ Pit. The talk will take place on 29 April 2015 at The Corner House, Heaton Road, NE6 5RP at 7.30pm (Doors open at 7.00pm. You are advised to take your seat by 7.15pm as we are expecting a full house). It’s essential to book your place by contacting maria@heatonhistorygroup.org /07443 594154. This event has been supported by the Heritage Lottery Fund as part of our ‘Heaton Beneath Our Feet’ project. This entry was posted in Events and tagged Heaton Main Colliery, miners, mining on February 5, 2015 by oldheaton. 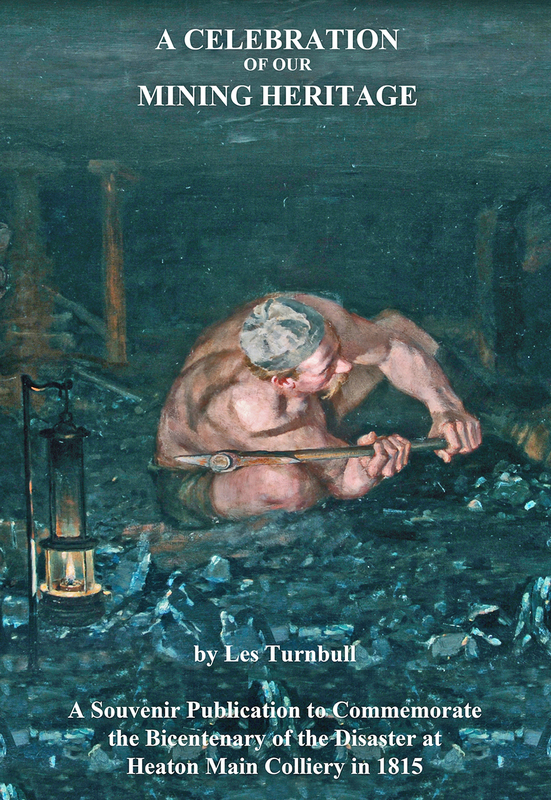 Les Turnbull’s book has been written to coincide with the 200th anniversary of the major disaster at Heaton Main Colliery in which 75 men and boys died. However, it covers much more than the terrible events of 1815. As the title indicates, it celebrates the importance of mining in the North East, Newcastle and Heaton, in particular, to the industrial revolution, mining safety, the development of railways and indeed to world history. It also looks at the lives of the colliers, engineers, mine owners and their families that contributed to Heaton’s mining heritage and the development of Heaton as a centre of population. The book’s publication is the first of over a year of commemorative events, supported by the Arts Council and Newcastle City Council, to take place under the banner of the Shafts of Light Festival. Check out the programme so far – and arrange events of your own which can be added to it. This entry was posted in Group Activites, Research, Resources and tagged Heaton Main Colliery, miners, mining on February 5, 2015 by oldheaton.